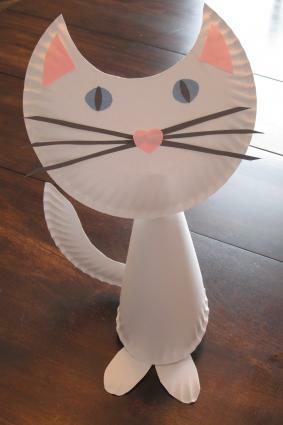 If you love felines and have a few extra paper plates at home, you can spend the afternoon making a paper plate cat. Paper plate craft projects are great because they don't require a lot in the way of special supplies. All you need is a little creativity! This adorable project is perfect for kids to do at home or in school. Elementary-aged kids will love this fun craft, which they can do independently. Because this project requires scissors, it's best for kids who are confident cutters. 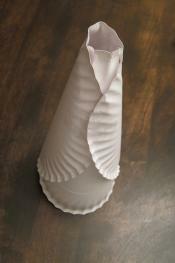 Start by rolling two of the paper plates into cone shapes. Roll them with the shiny side in. Tear off medium-sized pieces of tape and use those to hold the plates in place. Then stack the two cone-shaped plates together to make the cat's body. Cut the third paper plate along one of the ruffled lines and around the circle line in the middle to form a tail. The tail can be as long or as short as you would like. Tape the tail to the body so that it is sticking up. Cut out two feet for the cat from the remaining center circle and the rest of the ruffled edge of the third plate. These should be long rectangles with one rounded end. The rounded end should be the ruffled edge of the plate. Fold the squared off end up and tape the feet to the inside of the cone. Cut a half circle out of the fourth paper plate to make the cat's head. Turn it over so the shiny side is facing down. Cut two pink triangles and gently round one edge of each one. Glue them to the pointed part of the head to make the ears. Cut two rounded eyes out of the blue construction paper, and then cut two long slits out of gray construction paper for the cat's pupils. Glue the gray slits to the blue eyes, and then glue the eyes to the cat's face. Cut six whiskers out of gray paper and trim the ends to make them pointy. Glue the whiskers to the center of the cat's face. Top them with a heart-shaped nose cut out of pink construction paper. Allow the glue to dry on the cat's head. When it's dry, carefully tape the cat's head to its body. For a Halloween cat, paint all of your paper plates black before you begin. Use black construction paper to cut out a pointy witch's hat to make your kitty even more festive. Add a piece of colored ribbon to your cat's neck for a cute collar. Use googly eyes instead of blue paper to give your kitty a goofy look. Paint your cat gray, orange, calico, or spotted to make it look just like your favorite cat breed. Add a red-and-white-striped stovepipe hat to turn your kitty into The Cat in the Hat. Use smaller paper plates to make a kitten. Have fun getting creative with the supplies you have around home or school. You may find that you love this craft so much that you want to create a whole family of cats in different colors and sizes.